1. It should be simple. Keep the fancy for personal and household devices. Any brewer should be able to paint this on something. The Royal Brewer device, from the new Regalia box Lord Brian made for the next RB. 2. It should evoke Atlantia somehow. I don’t see tying Spike into brewing, despite the Royal Brewer’s badge (which has Spike between two mugs – see the picture on the left). 4. It should not look like other kingdom brewers guild badges – there aren’t very many of them. 5. It should reference beer, wine, mead, cordials, and our favorite non-alcoholics like vinegars, without discrimination. Our Guild includes all of these. 6. When people see it, they should be able to associate it with brewing without too much trouble. 7. It should be easy to get approved by the Kingdom and Society College(s) of Heralds. To that end, I’ve enlisted the aid of a couple of tireless book heralds, who know this stuff, and am allowing myself to be guided by them. 8. It should look nice. Usually you see white on the top/bottom or right/left, and blue in the middle, but we can go either way. 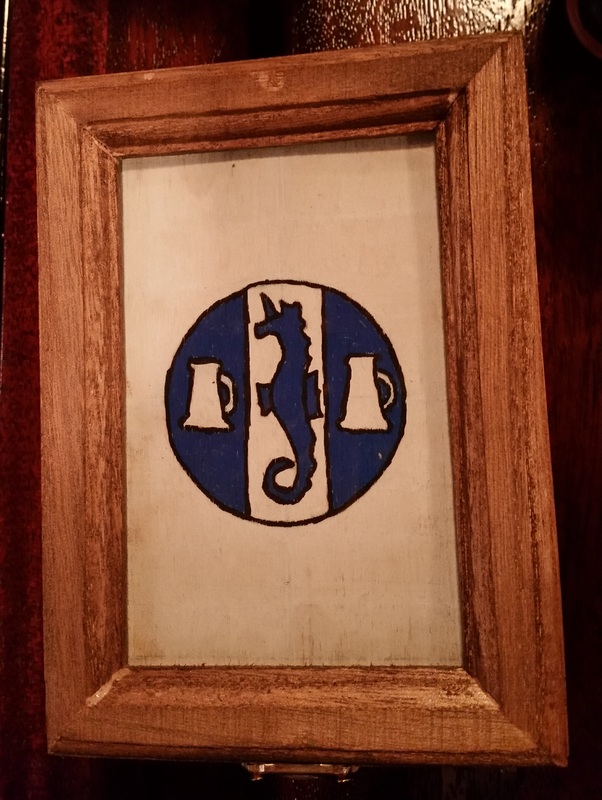 Heraldically speaking, white is argent/silver and blue is azure. So let’s get some polling on which of these you prefer, and in what color order – or neither, and you’re going to email me your preference (webminister@brewers.atlantia.sca.org). Which field do you prefer? None of the above. I will comment/email the list/email you. Which color sequence do you prefer? To one of those fields, let’s add a charge, or a figure. I vote we pick one thing to put smack in the middle of the middle stripe, no matter which way it goes. If the charge is on the white/argent/silver part, the charge itself can be gules/red, azure/blue, vert/green, purpure/purple, or sable/black. If the charge is on the blue/azure part, the charge itself can be silver/argent or gold/or. So let’s poll some more, while I have you here. What color shall our charge be? We don’t want to compete with our own brewing groups, Woodside Priory and the Company of St. Arnulf. Woodside uses a barrel, and I’m not sure that St. Arnulf’s has a badge of any sort. If I’m wrong, folks, let me know. 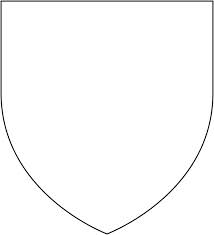 For charges that would pass Heraldic inspection, I consulted A Pictorial Dictionary of Heraldry, by Master Bruce Draconarius of Mistholme. It was recommended on the Atlantia heraldry page. It’s been around a long time, but bless him, he’s put it online, and done a good job of converting it to a web-enabled tool rather than a flat document. There are three ways to search the site. One is by first letter, another is by category. Not all the charges in there are indexed, some are only linked from other devices – vessel, for instance, links to quite a few. There’s also a link to “Full Alphabetical Search”. The search box works fairly well. If you can’t find one of the charges I mention below, don’t despair – try another route. Cup/beaker/goblet- just not the one Caid uses, which has a small stem. There are several shapes available. For what it’s worth, I vote we avoid the British covered cup; no one will recognize it. Of these, there are several I like. The bottell is pretty cool – it was designed to carry on horseback, and I like the hint that we travel and share. Amphoras, flasks, and pitchers all invoke making in bulk and sharing, and are graceful besides. I like the mazer/drinking bowl a lot, but like the drinking horn, that may not appeal to everyone. There is probably a cup shape we all could work with – it just has to be different from Caid’s. If you don’t think there’s ever been a cup of vinegar, look to your hip socket – the part your thigh bone fits into is the acetabulum, the vinegar cup. I think wells and buckets are a stretch for people to think of brewers. Bottles remind people of drunken bums, and we’re trying to get them to see us another way. Cauldrons are forever associated with witches; if we want to use any of the pots we’ll have to be careful to get one that’s recognizable. I’m not sure whether people would see a flask and assume we’re alchemists. I could poll on this, but the tool only allows me to give you one choice. I think we need more discussion. Let me hear you! Leave a comment, post to the e-list, email me separately. What charges do you like, and why? Which one(s) do you prefer over others? Thinking of entering a brewing competition? Congratulations! Good for you! It takes a bit of courage and preparation. We are always excited to meet more folks interested in the medieval ways of making alcoholic beverages. For most of us, competitions are for getting feedback and learning. Presentation You MUST mark your bottle – a label or well-attached tag – with your name and a list of ALL the ingredients, or it won’t be considered. we favor good bottling methods – leaning toward the modern – but if you present in a period-appropriate way that’s good too – more points for explaining why you chose what you did in your documentation (1 paragraph will do). Cordials There are particular issues presenting a period cordial, which are discussed in this post. Documentation We want documentation, but we don’t want a lot. Two or three pages will do. This is one of the big differences between the Guild and an A&S competition. For the Guild, we want to know what historical recipe you’re using, your redaction (what you actually did; there are always compromises), and what you’d do differently the next time you make it. Bibliography We want a bibliography – you got that recipe somewhere, so tell us where. We’d rather you went to the original source. These days a lot of our best sources are on Google Books, Google Scholar, Project Gutenberg, or a similar website. Your friendly local SCAdian brewer may have a copy of the book. Sometimes you have to use three or four historical sources to figure out what the original author was talking about – show them. If you also referred to modern sources, include them. Judging At Atlantian Guild competitions, we always try to have three judges present. Scores are usually an average of the three individual scores. We encourage brewers to be present when their entries are discussed so they can hear what the judges are looking for, receive feedback, or possibly answer questions. A competitor generally doesn’t offer up conversation or information unless the judges ask. For one thing, it distracts the judges, who are always on a time schedule (even if they’re glad to see you and forget that schedule for a moment). One of the features of judging an SCA brewers’ competition is that you never know what entries are going to show up. Judges may adjust their scoring according to what entries they have. That’s considered to be fine, as long as the same adjustment applies to everyone and is fair to all entries, and all the judges agree to it. A certain amount of subjectiveness is part of any judging process. While most of our judges are pretty experienced, and try hard to be both fair and consistent, there can be judges who, that day, really care what kind of cork you used. It happens. The competition form is not always used with the guidelines rubric. We, the Brewers of the Kingdom of Atlantia, in order to continue the practice of brewing within our fair kingdom, do request that the Crowns of Atlantia renew our guild’s charter. The guild, which shall be henceforth known as the “Brewers’ Guild of Atlantia,” will encourage the practice, research and understanding of brewing within this realm. The following articles will delineate the purpose, officers, rankings, and potables recognized by this guild. (e) To assist the brewers and populace with abiding by the alcohol policies of the Society for Creative Anachronism, Inc. 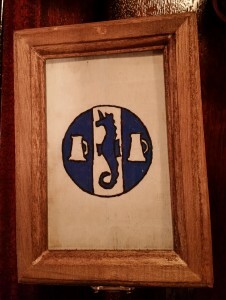 Membership in the Brewers’ Guild of Atlantia is open to any gentle that resides within the confines of the Kingdom of Atlantia and has expressed interest in furthering their understanding of the arts of Brewing. Apprentice: Any brewer of the guild who has demonstrated proficiency in ONE style of the six recognized by the guild. A brewer advances by having brewed one beverage with a score of 75+, judged either formally or informally, by three Atlantian Brewing Guild Judges. Journeyman: An Apprentice brewer advances to the status of Journeyman Brewer by demonstrating proficiency in TWO styles of the six recognized by the guild. A brewer advances by having brewed two beverages of different styles with scores of 80+, judged either formally or informally, by three Atlantian Brewing Guild Judges. Master: A Journeyman brewer advances to the status of Master Brewer by demonstrating proficiency in FOUR or more styles of the six recognized by the guild. A brewer advances by having brewed four beverages of different styles with scores of 80+, judged either formally or informally, by three Atlantian Brewing Guild Judges. (d) Brewmaster of Atlantia: An honorary rank that is bestowed by the Guildmaster to those members who are considered to have a lot of brewing experience, are actively brewing and willing to teach others. The guildmaster should be chosen from among those with the rank of Master within the Brewers’ Guild. The guildmaster holds the membership listing and rankings for the Brewers’ Guild. The guildmaster shall advise all Brewers as to the nearest teacher recognized by the Guild. The guildmaster will submit a progress report to the Crowns at their Coronation. The Guildmaster is expected to remain active, during their tenure, in order to keep abreast of advancements within the guild. (b) If at any time it becomes necessary for a guildmaster to become inactive, s/he is expected to name an interim deputy or to recommend a successor, depending on the expected length of inactivity. Should it become necessary to replace or remove a guildmaster in absentia, the Guild members are to be presented with a list of candidates from among those of Master rank. The next guildmaster is to be chosen by popular vote, with the consent of the Crowns. (a) Any brewer who represents the guild in their local SCA group. Responsible for: promoting the guild within the group, assisting Autocrats in complying with SCA Alcohol Policy, encouraging new brewers in their group, sponsoring competitions, and reporting local brewing activities to the Guild as needed or at least 4 times a year. (a) The webminister shall be in charge of maintaining the official website for the Brewers’ Guild of Atlantia. The term “potables” refers to the various styles of brewed beverages and the official categories into which they are to be classed. The charter shall be considered the definitive classification for any guild sanctioned brewing competitions. However, this list is not exhaustive. Meads: Covers most drinks with honey as the main fermentable ingredient. These include traditional meads (made with honey and water), metheglins (added herbs and spices), and melomels (fruit and honey). Wines: Includes fruit wines, hippocras and spiced wines (only if the brewer fermented the base wine), and other variants. Vinegars: Includes both herb-infused vinegars, fruit-infused vinegars, and vinegars created by the brewer from an alcoholic base and a mother of vinegar. (f) Non-Alcoholics: Includes fruit, herb, or flower syrups and any vinegar based beverage.